Text 3 — Enter an optional, user-defined value that is routed to the exchange for clearing and back office purposes. Maps to Tag 25009. Enter up to 12 alpha-numeric characters, special characters are allowed. Cross ID — Enter the user's self-matching prevention (SMP) ID provided by the exchange. The SMP ID prevents the user from cross matches and its use is optional. The exchange's self-matching prevention functionality applies to all natively supported order types and mass quoting, but does not apply to auctions or synthetic matching. Max Order Rate — Sets the maximum number of orders per second that a user can enter per connection. This limit cannot exceed the exchange-defined order rate maximum. Messages exceeding the maximum rate are rejected by the exchange. Trader IDs are added by configuring the User ID Override setting on the More | Trader IDs tab. You can also select Add New from the trader ID selector when clicking an entry in the table. Trader IDs that are user-defined must be configured on the Trader Ids tab. This value overrides the exchange-provided trader ID (User Id) on the exchange connection for all orders sent to the exchange. The Trader ID can be up to 11 characters. User IDs can be shared (i.e., configured at the session level) for Eurex connections. 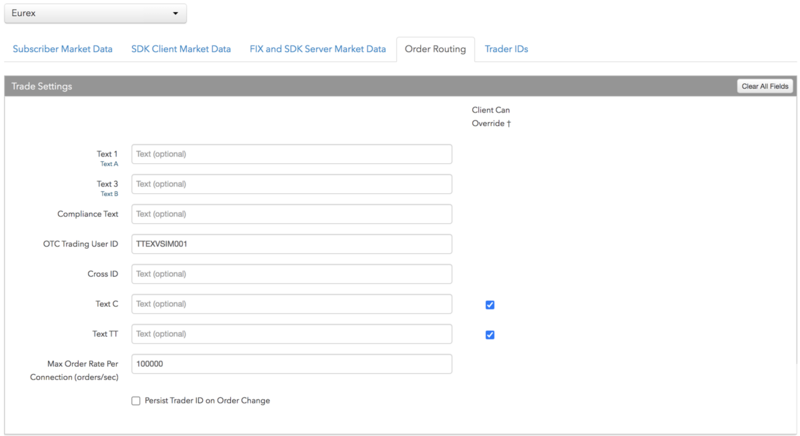 To override this per user, click the trader ID for the connection in the Trader ID grid and add a user-defined trader ID. A Eurex connection only appears in the grid if the account assigned to the connection is also assigned to the user. Note: If a User Id is not configured for the connection, then each user assigned to the connection must have a Trader ID assigned — individual trader IDs are also mapped to Tag 50. Eurex requires Tag 50 on all order actions.